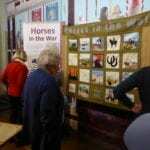 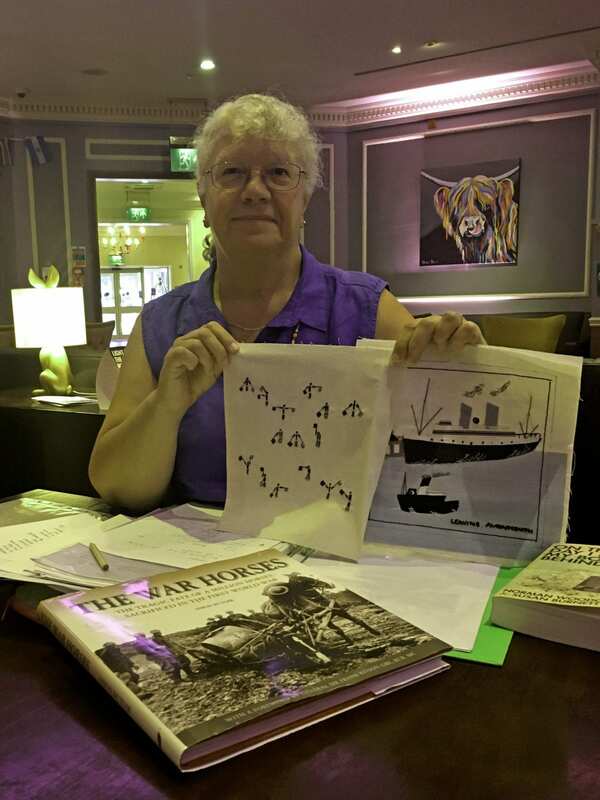 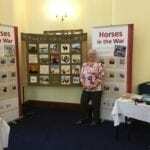 The ‘Horses in the War’ banner was displayed at a ‘Lest We Forget’ digital collection day organised by the West Somerset Family History Group on behalf of a project being run by the Commonwealth War Graves Commission/Foundation and Oxford University. 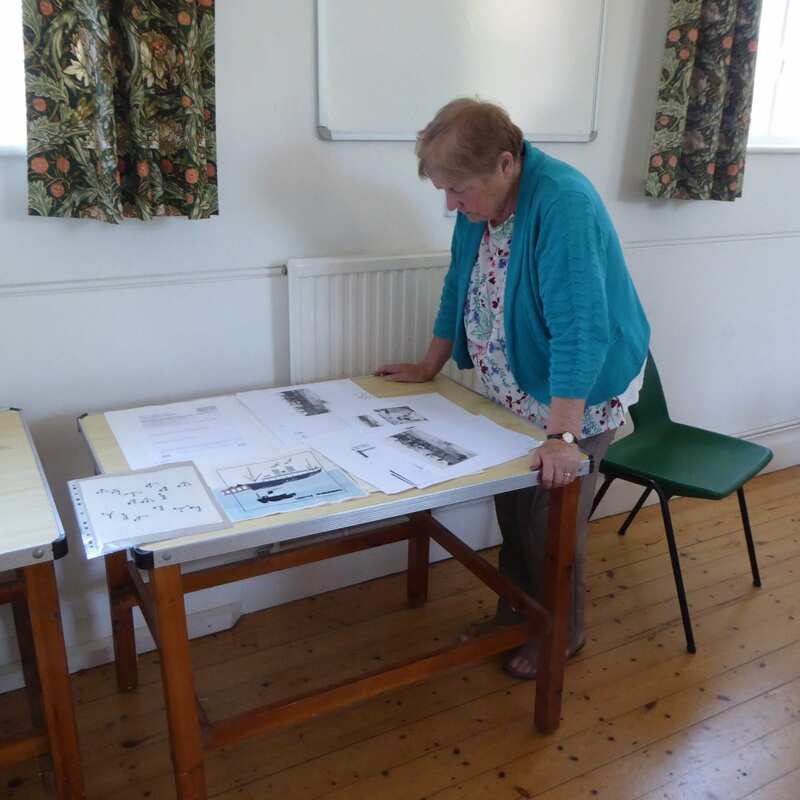 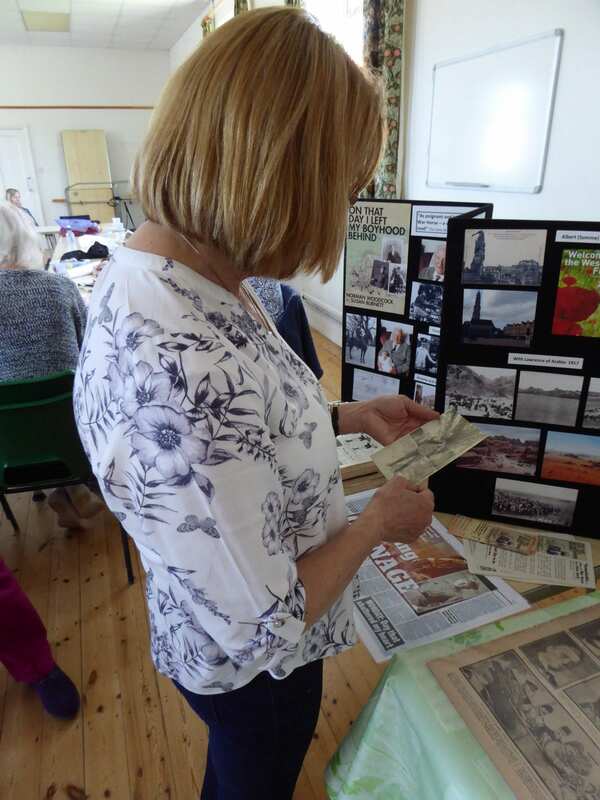 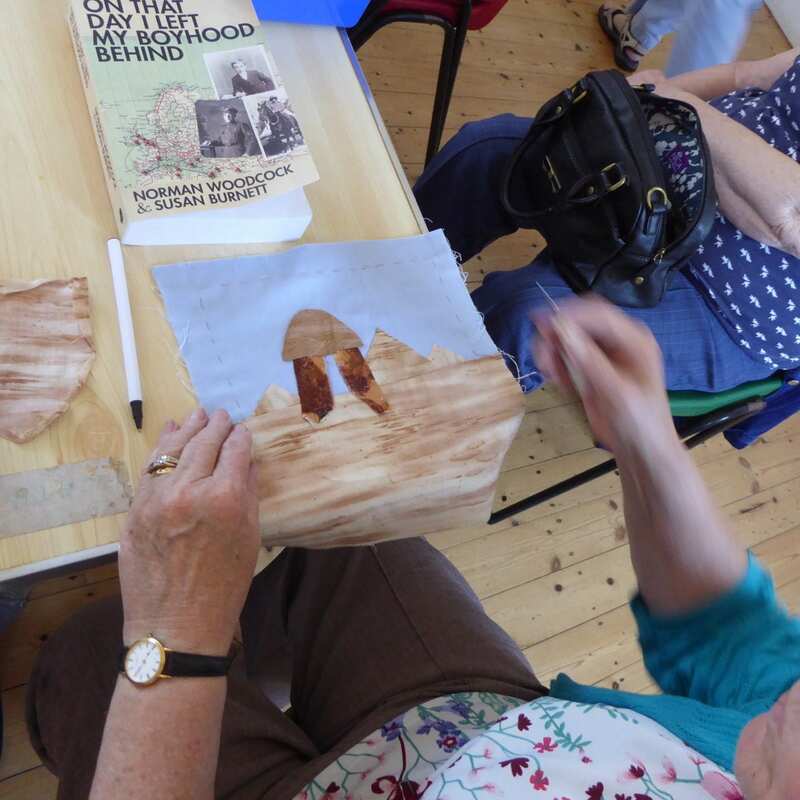 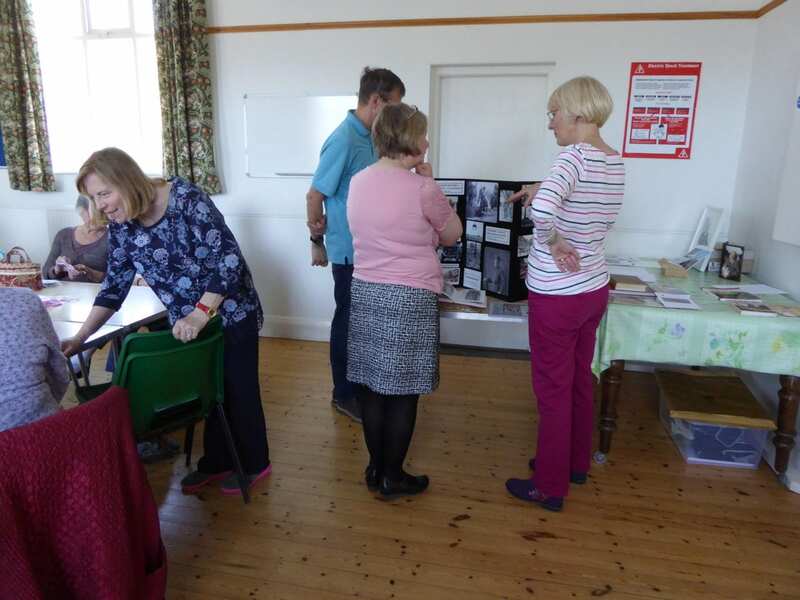 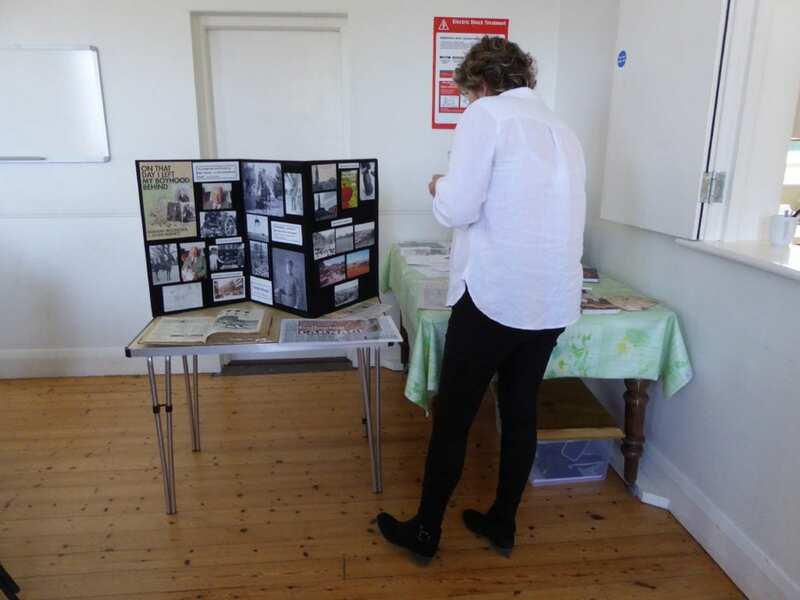 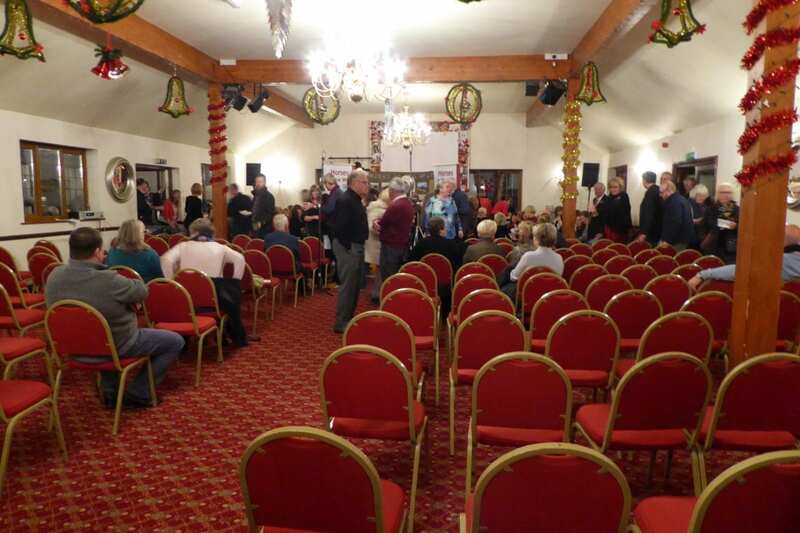 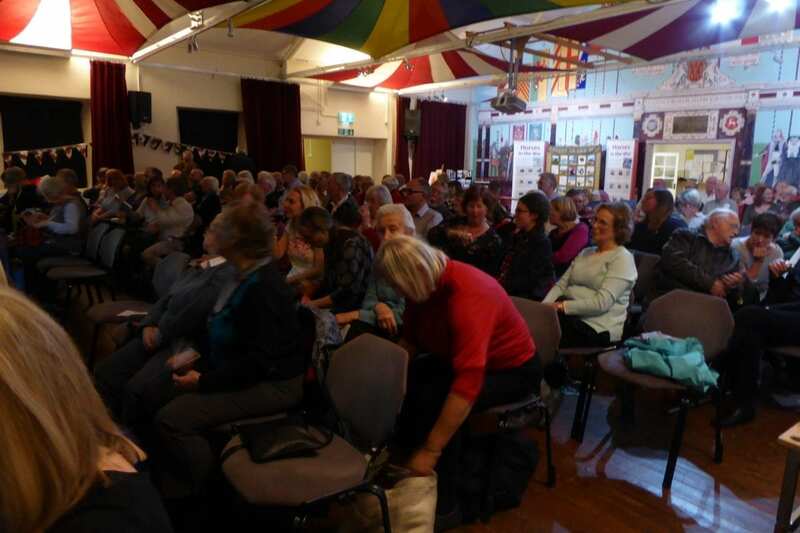 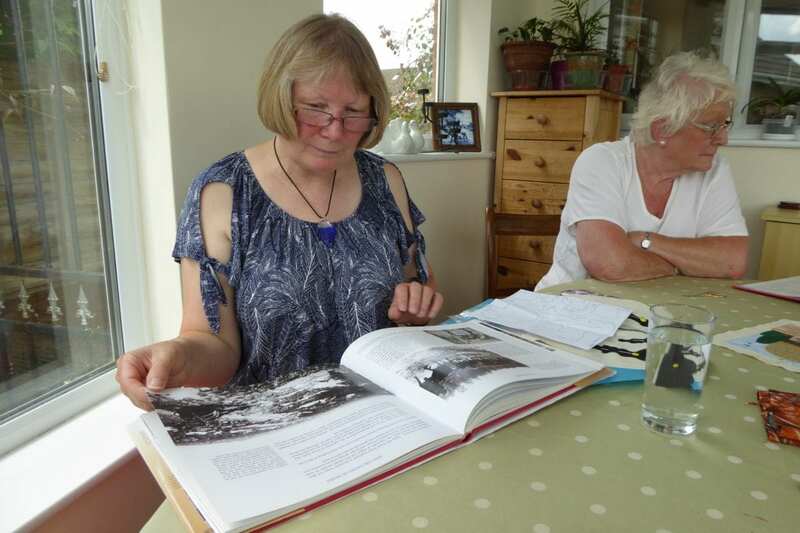 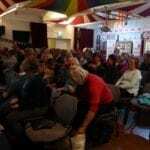 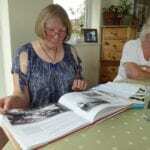 This event was held at Williton Pavilion, Williton, Somerset and is one of a series being held across the UK to enable members of the public to bring along their First World War objects and stories. 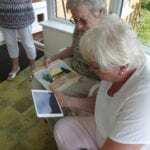 The stories are recorded and the objects either scanned or photographed for inclusion in a digital archive. 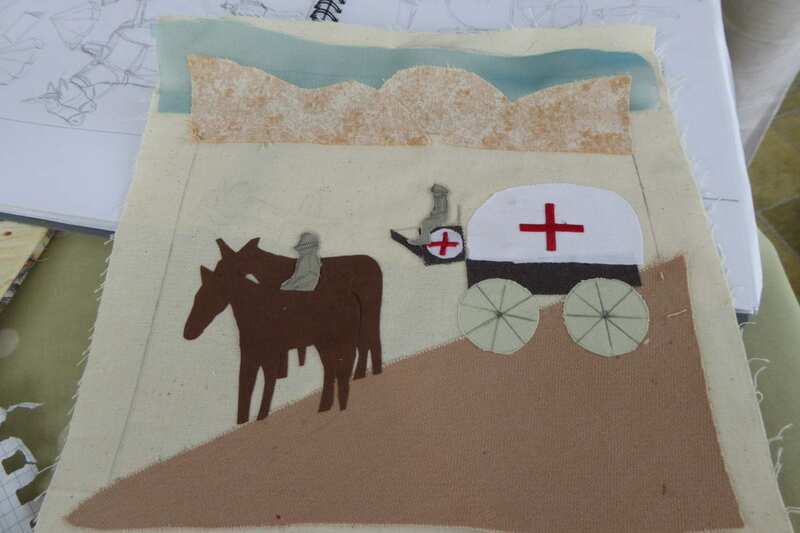 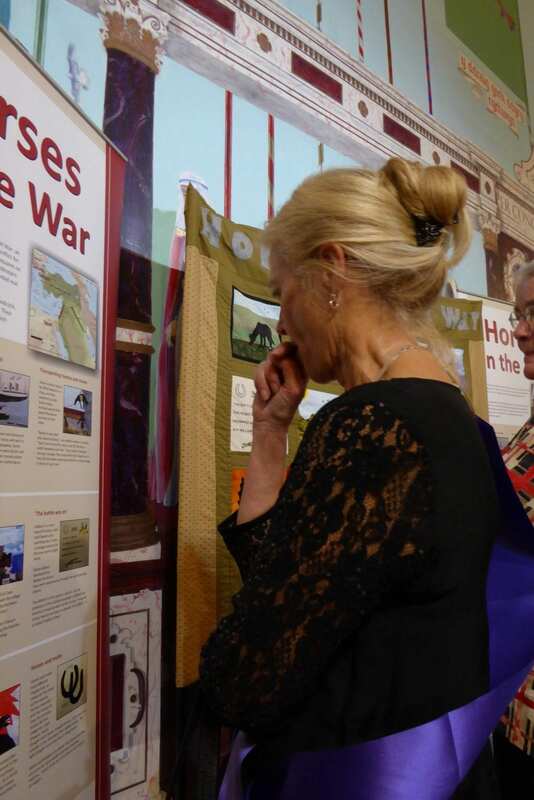 The ‘Horses in the War’ banner and its accompanying panels formed part of a small exhibition for visitors to the event and it was very well received. Other items were brought along by a West Somerset group of WW1 re-enactors including a First World War saddle which was a perfect addition to the banner. 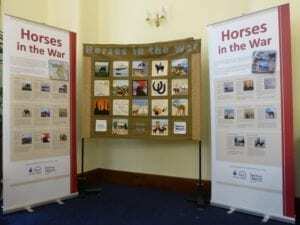 Plans are underway to take our ‘Horses in the War’ banner on tour this year, so that we can continue to share stories of the role that equines played in the First World War and raise awareness of the lesser known campaigns in the Middle East. 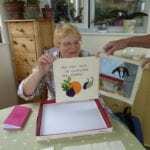 It is hoped that it will be displayed at War Horse Valley Country Farm Park, Iddesleigh, Devon, from Easter until the end of July. 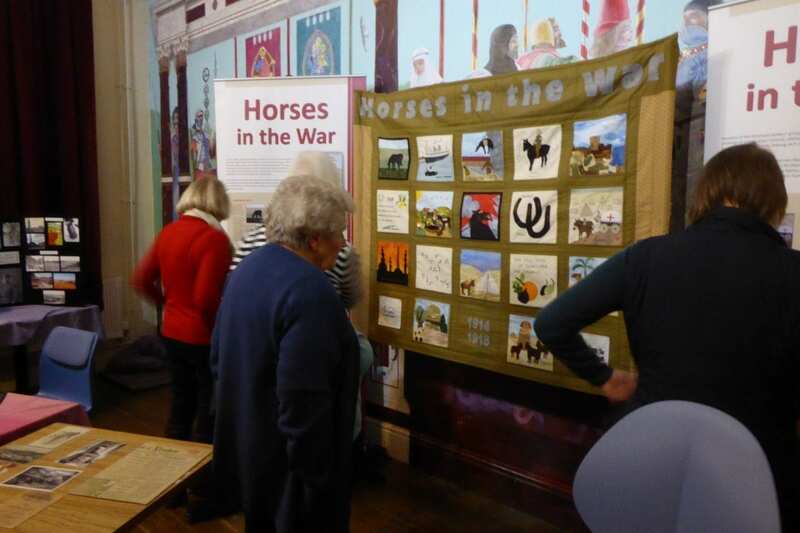 From August until mid-October, it will be displayed at Axbridge Museum in Somerset and in November it will be back in Devon at The Donkey Sanctuary in Sidmouth. 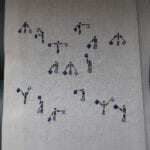 More details will be posted here once dates have been confirmed. 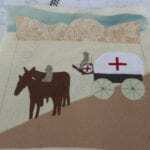 “My great-grandfather, George Ayres, fought in WWI in the Royal Horse Artillery. 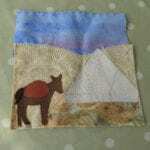 He loved his horses and it broke his heart when they were hurt. 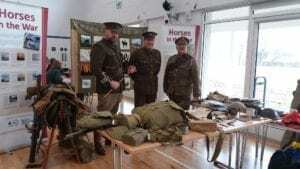 He survived every major battle, and came home, gassed, to his 5 year old son Bert, my grandad, who was so proud of him. 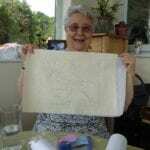 God bless you for this fantastic piece of important history! 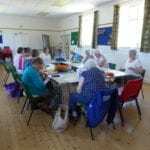 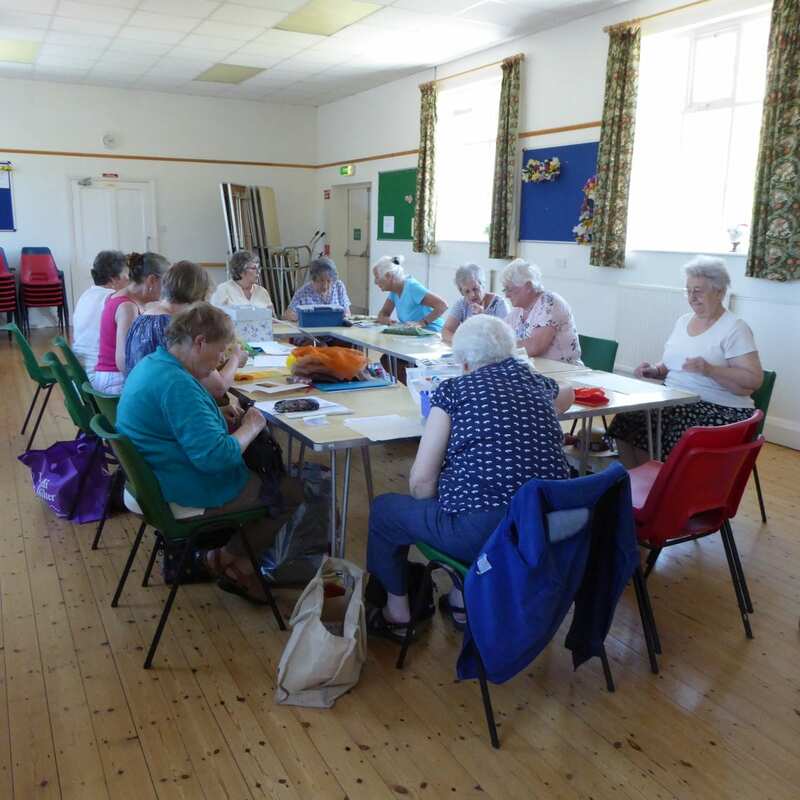 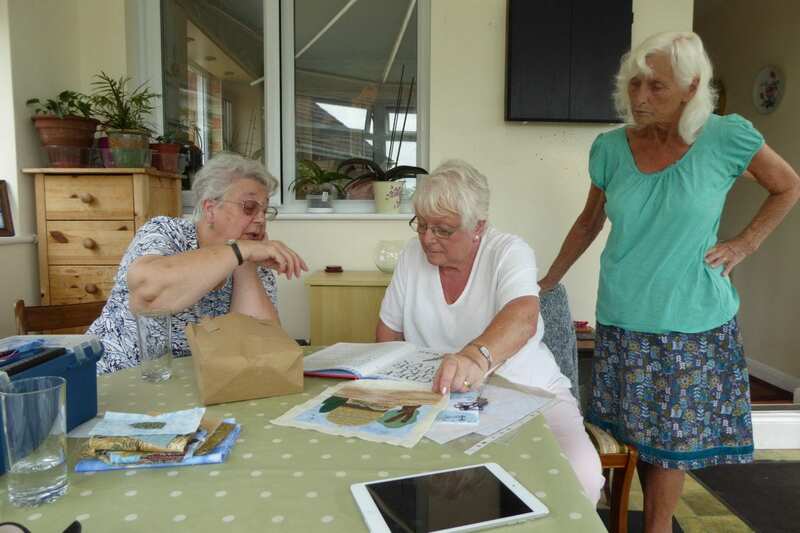 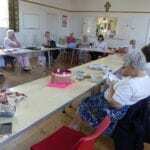 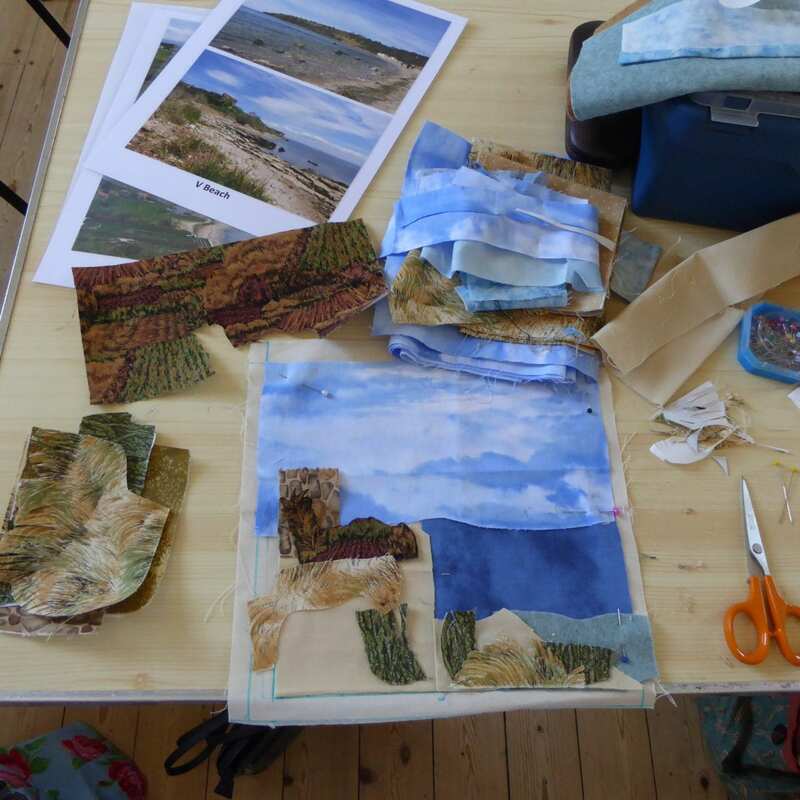 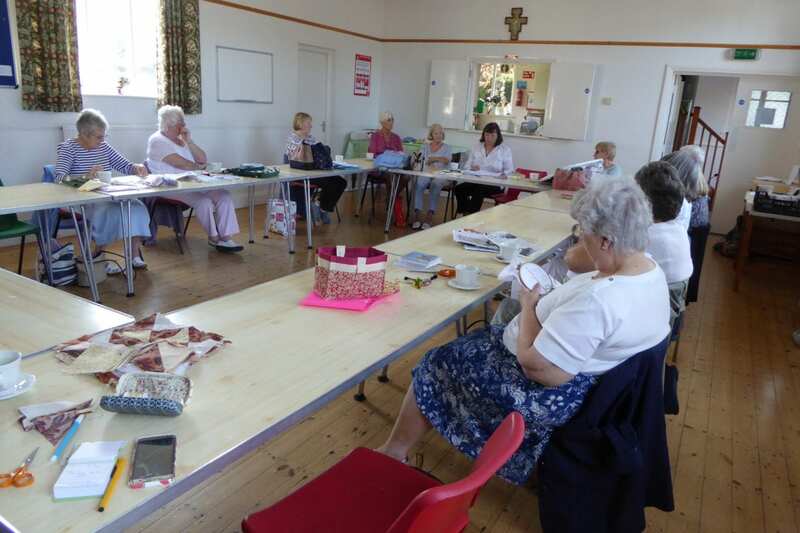 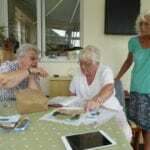 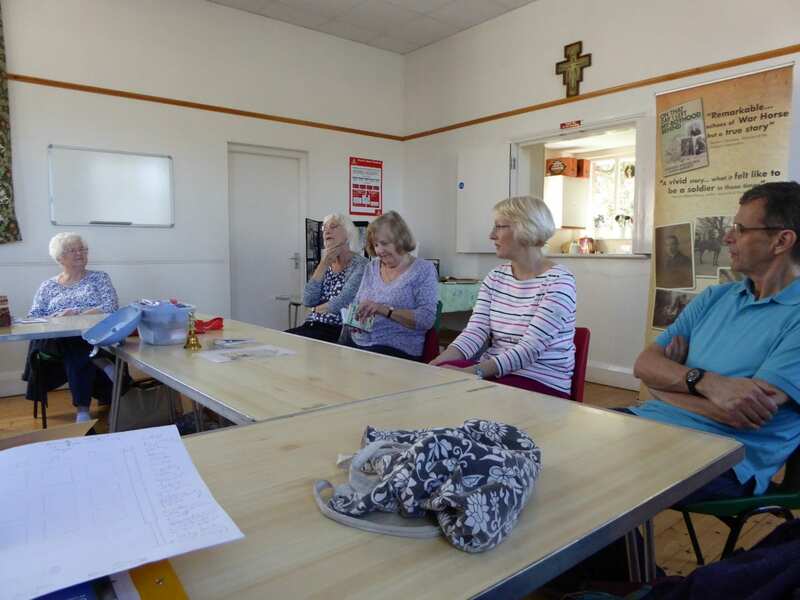 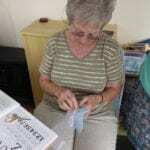 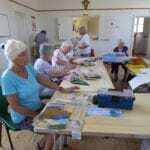 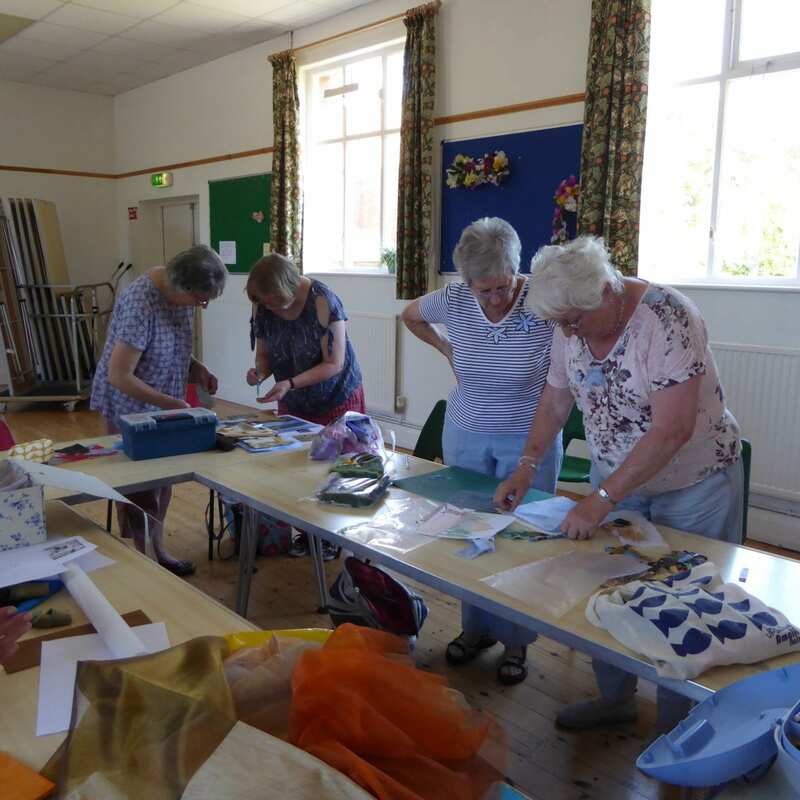 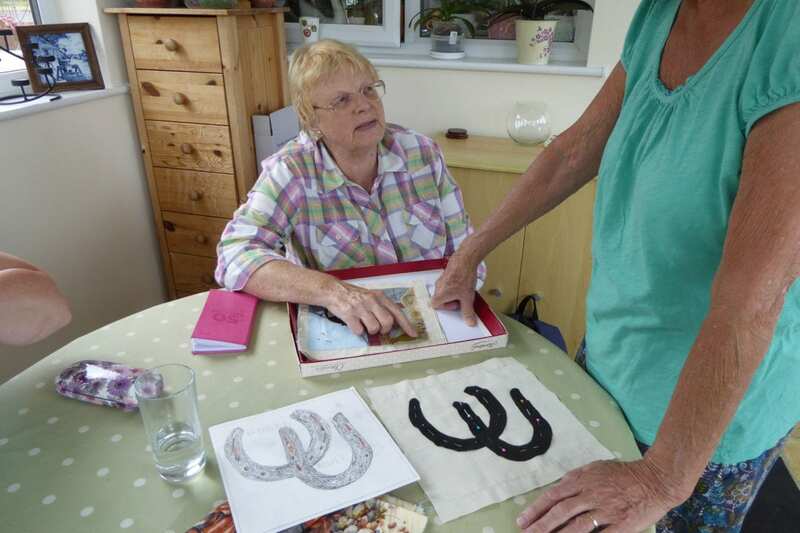 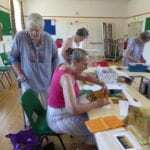 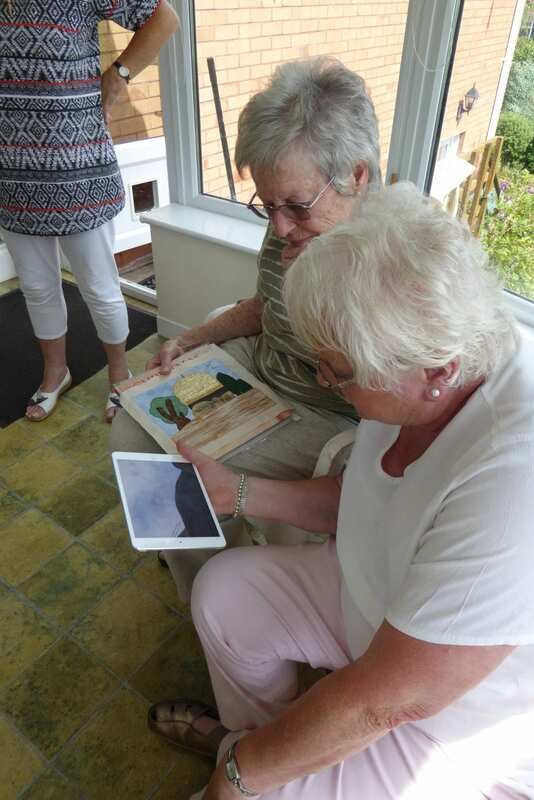 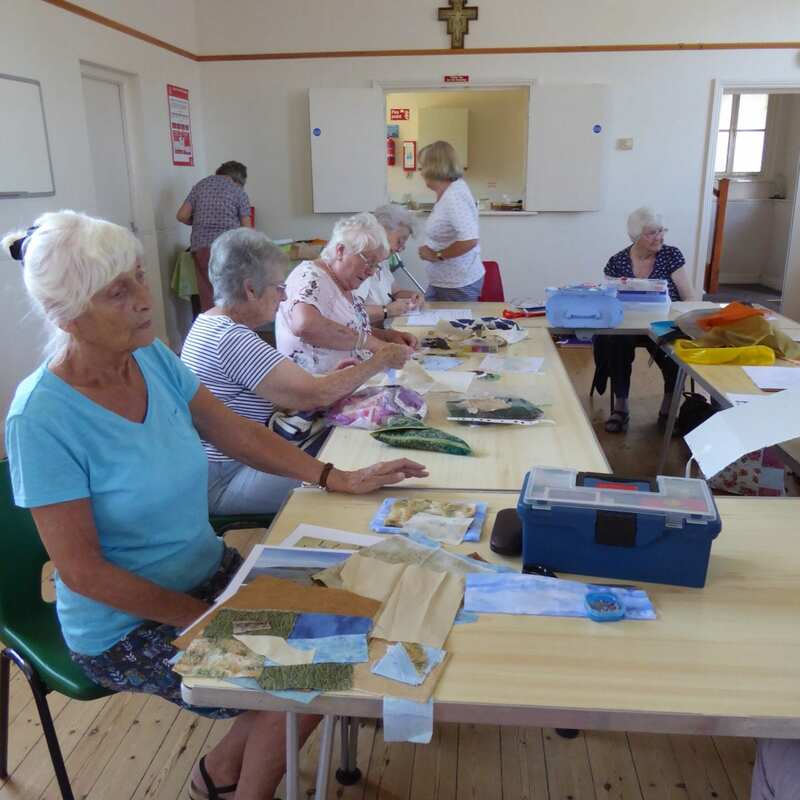 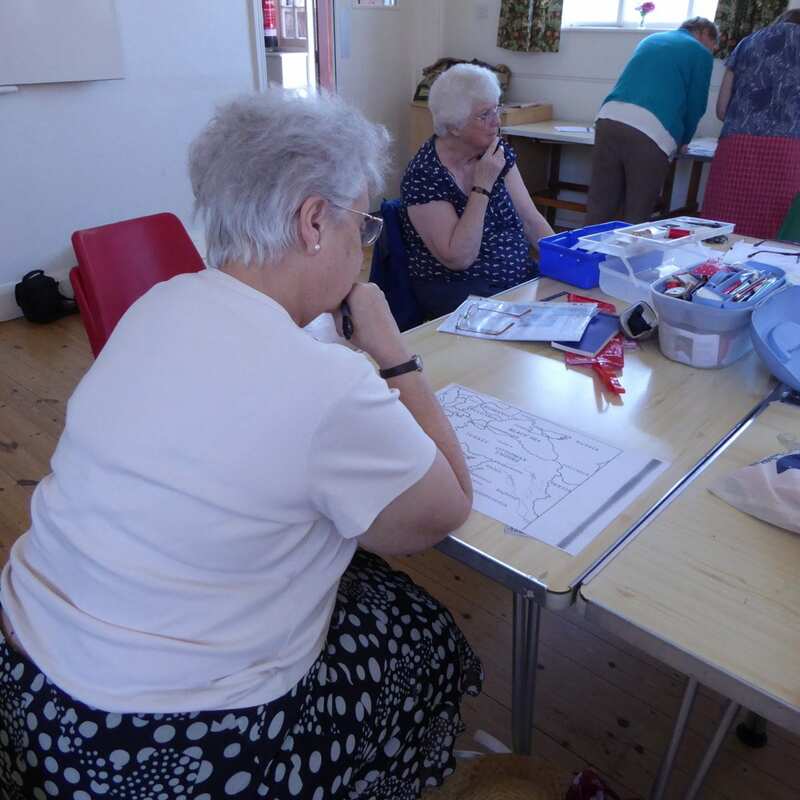 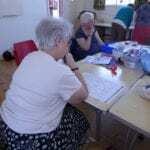 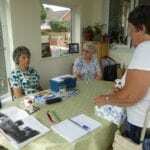 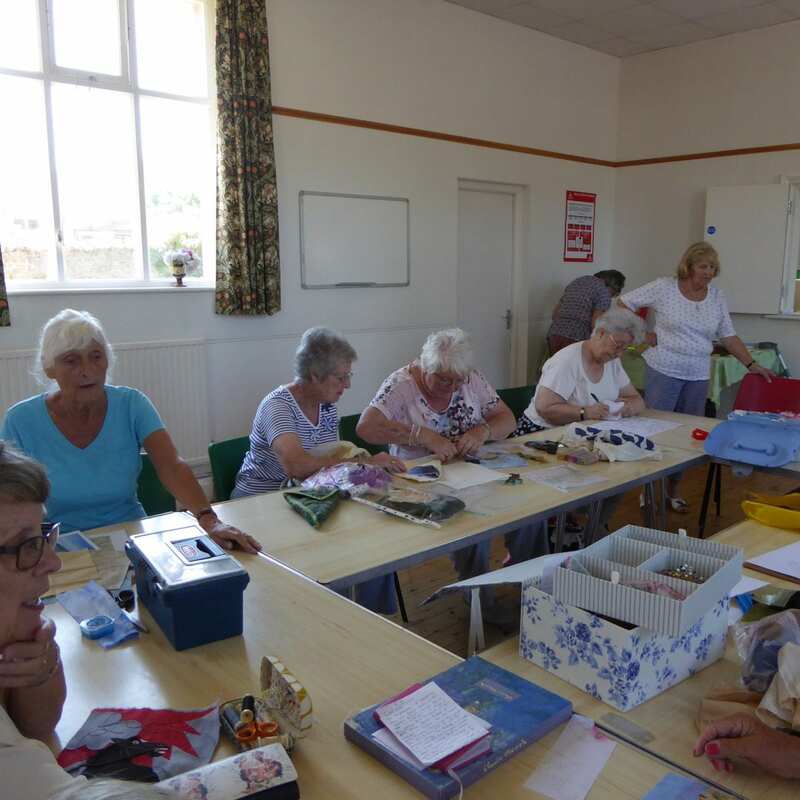 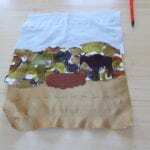 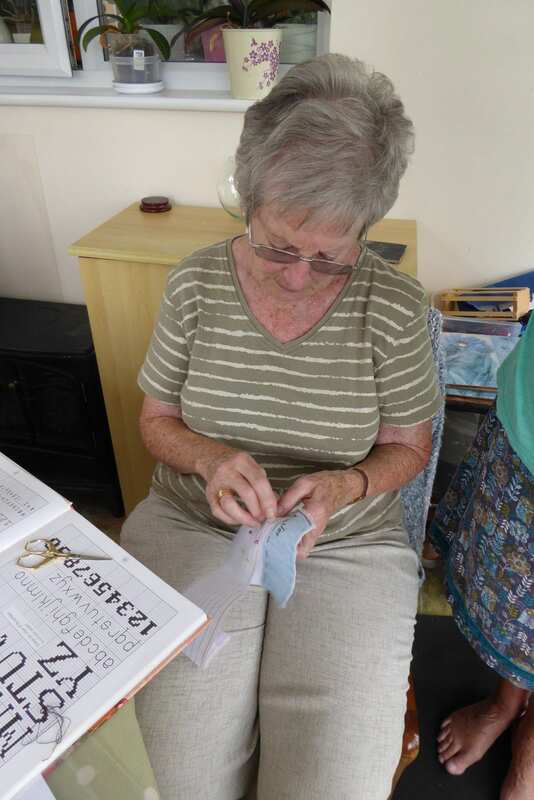 The Minehead Quilting group started again after a summer break, on 5 September. 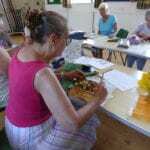 The members had worked hard over the summer to finish their squares. 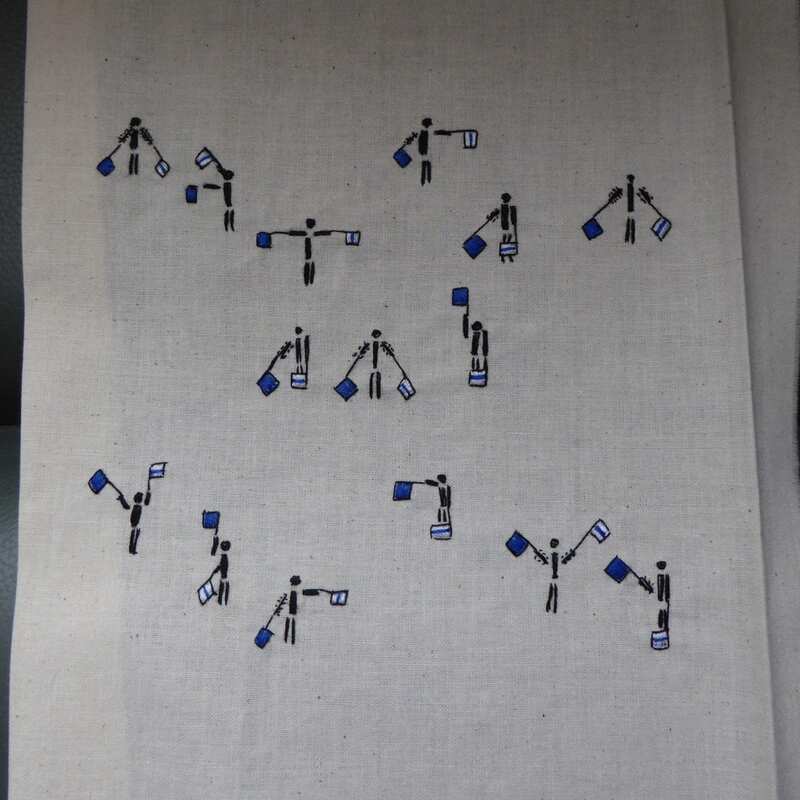 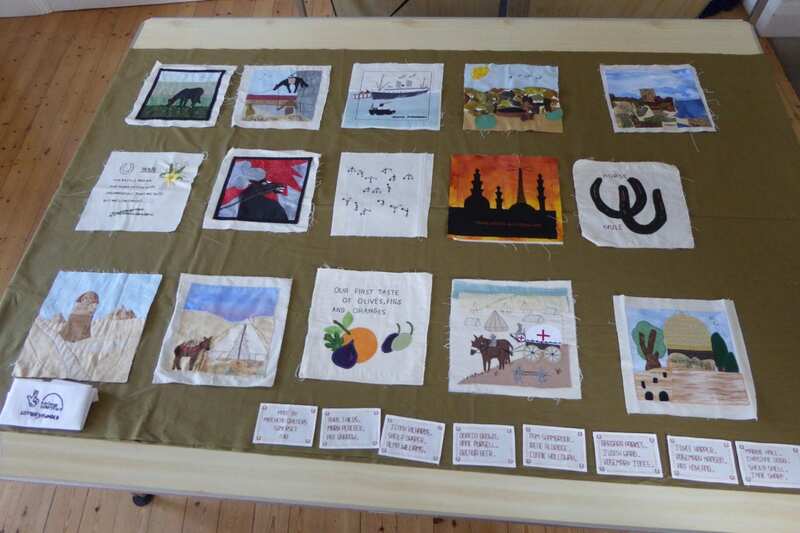 There are still two more to be finished completely but by seeing the squares all together it gave a good idea of how the final banner would look. 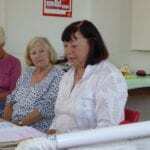 Historian Rita Tremain joined the meeting. 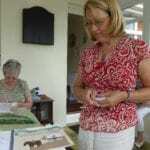 She lives in Minehead and is involved with the Brooke charity for equine welfare. 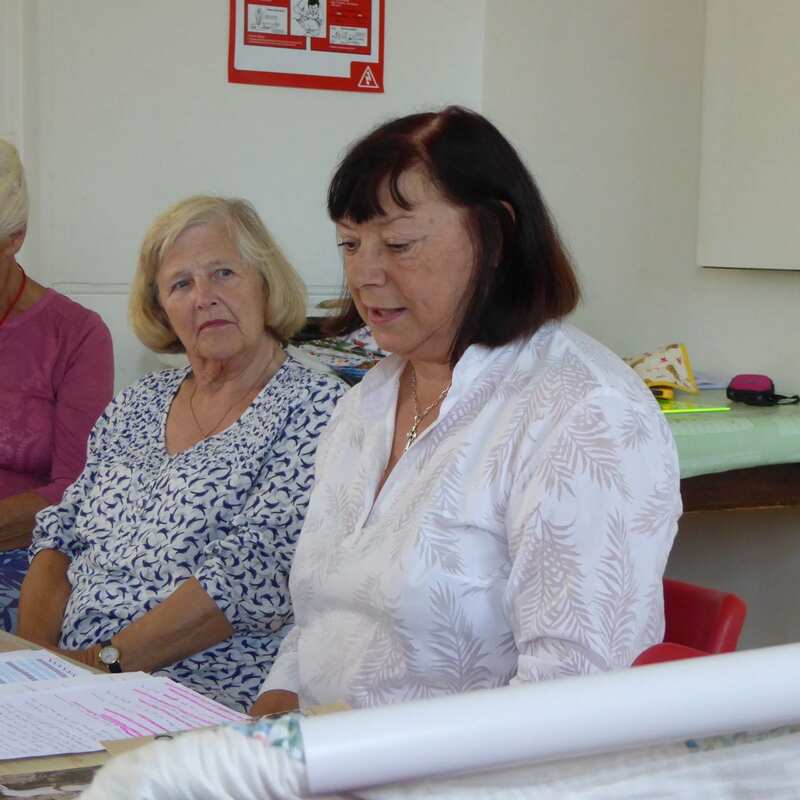 Rita gave the group a very interesting insight into how the animals were sourced, where they were brought for rest and training before being sent to war, and how they were transported. 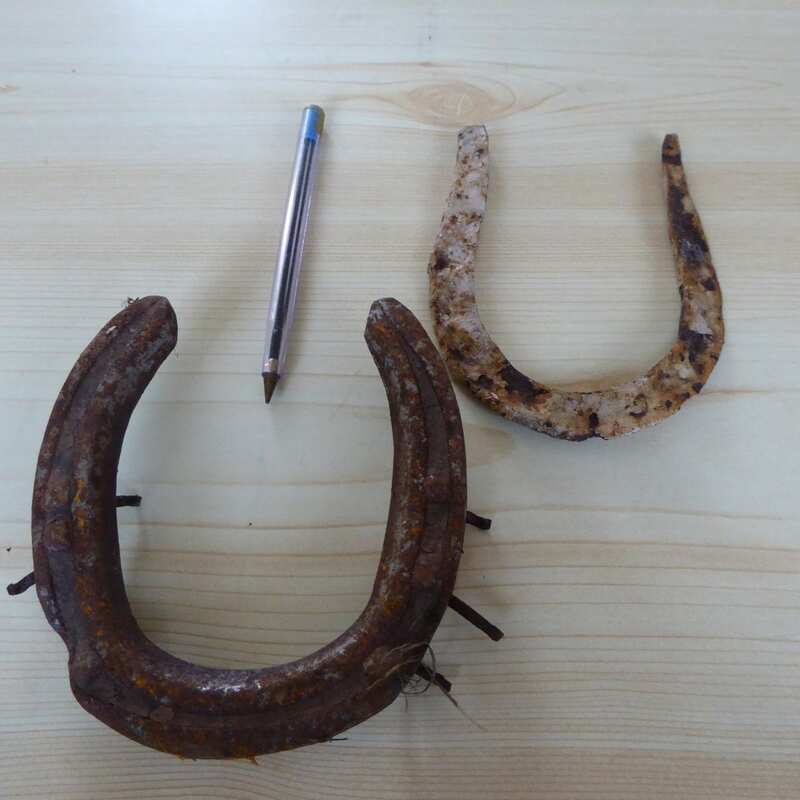 She talked about Remount Stations 11 and 12 which were at Bratton Farm in Minehead, and even brought along a mule shoe, found at Bratton, to compare with a pony shoe. 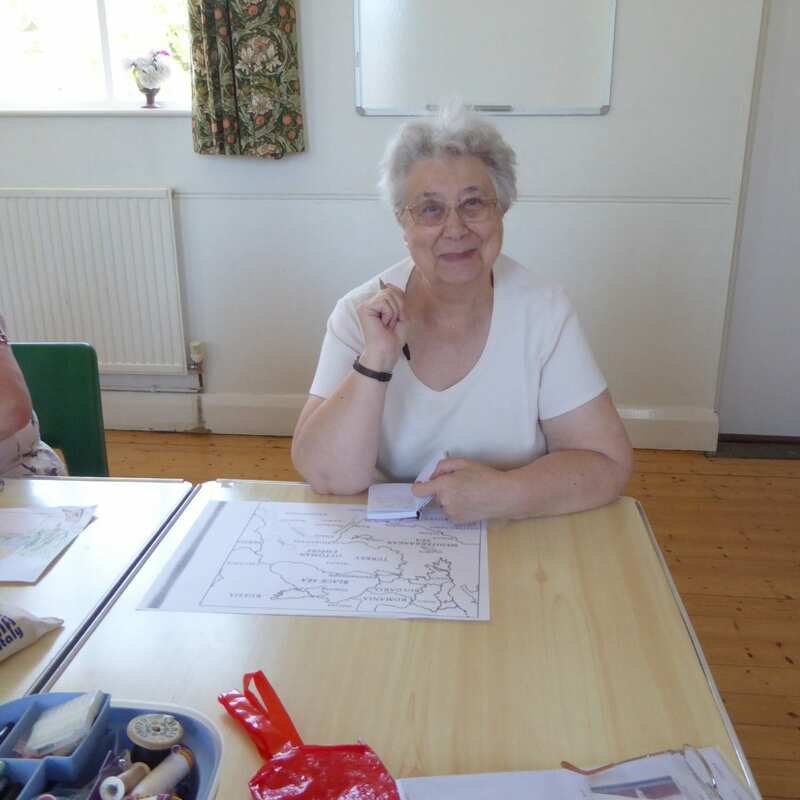 Everyone learned a lot from her talk and said how much they enjoyed it. 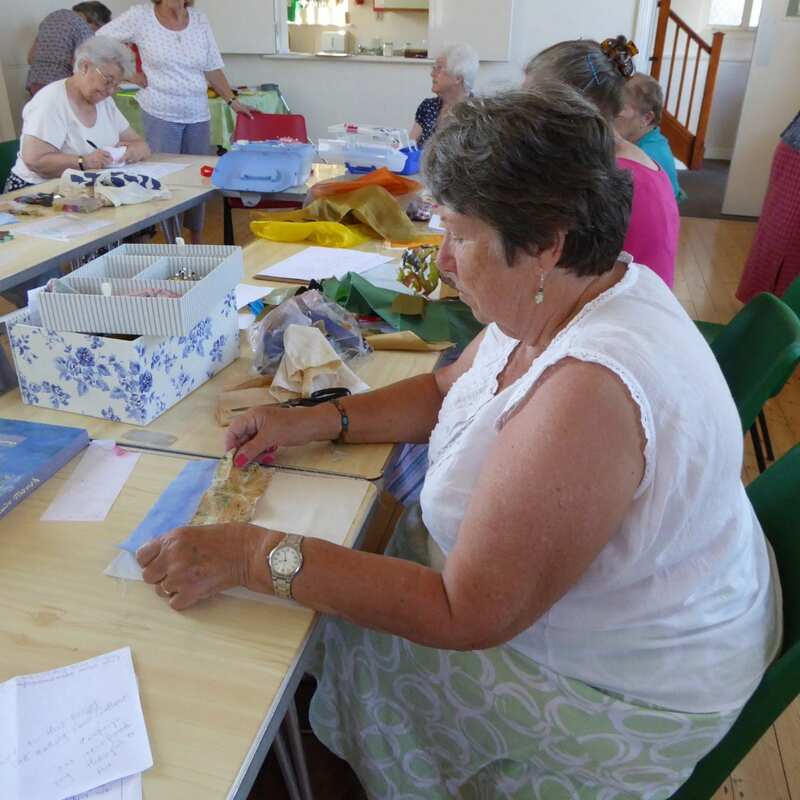 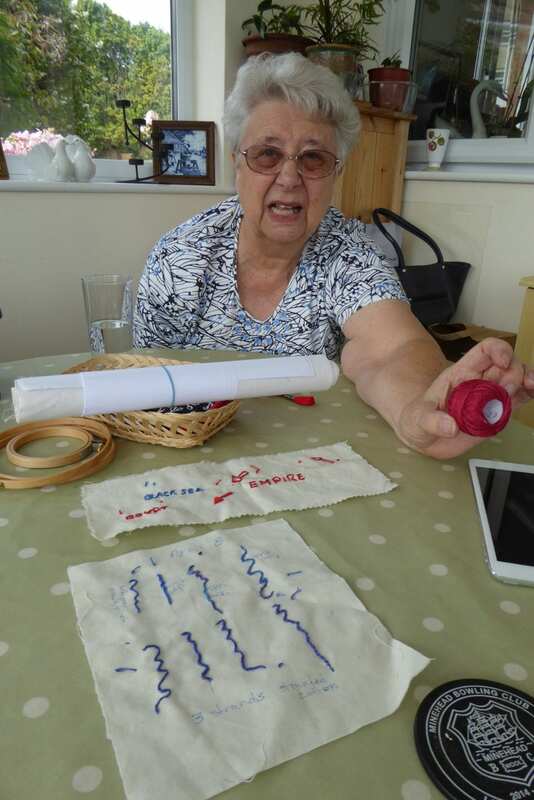 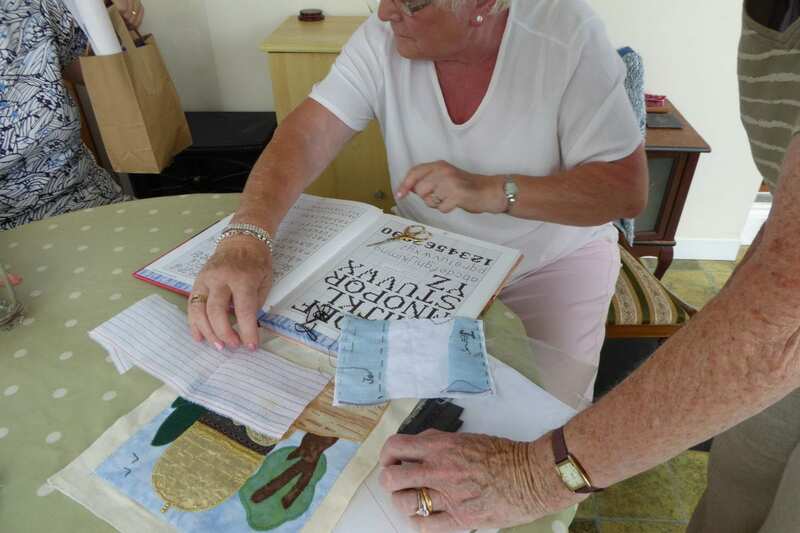 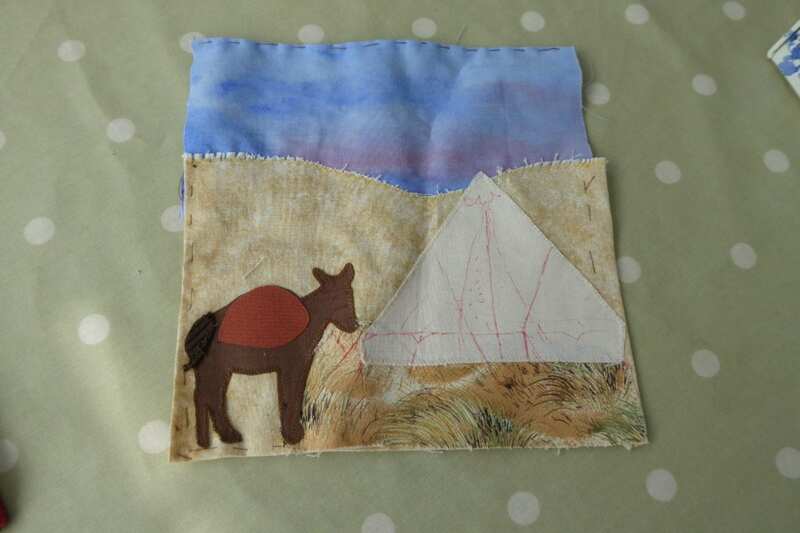 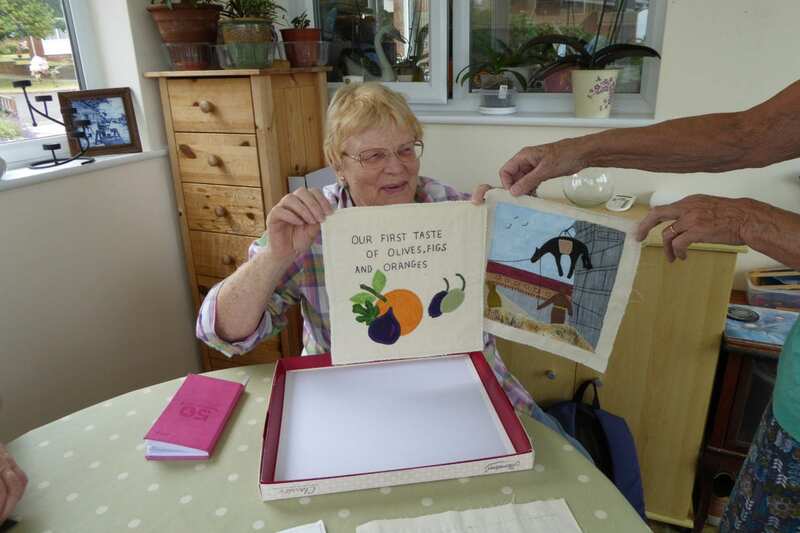 The Minehead Quilting group has been working hard over the summer months, making stitched and appliqued squares for our banner project. 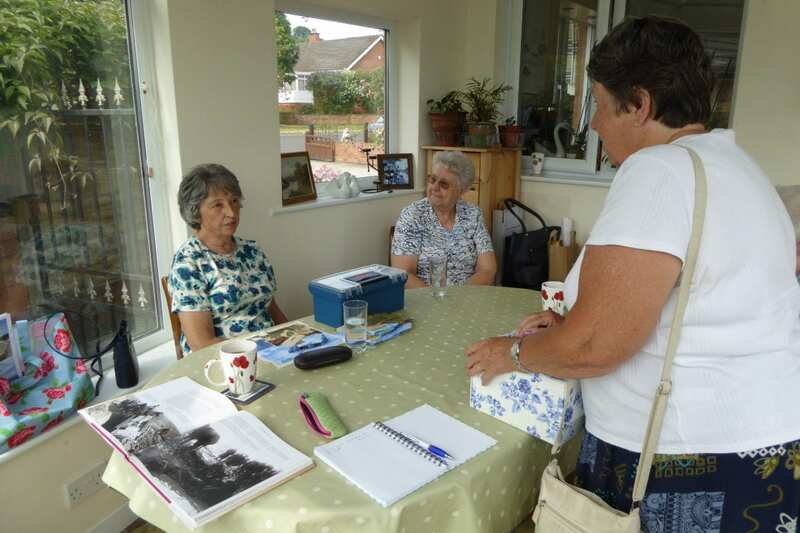 We arranged a “drop in” day in July, where they discussed their work and asked for advice from the other group members. 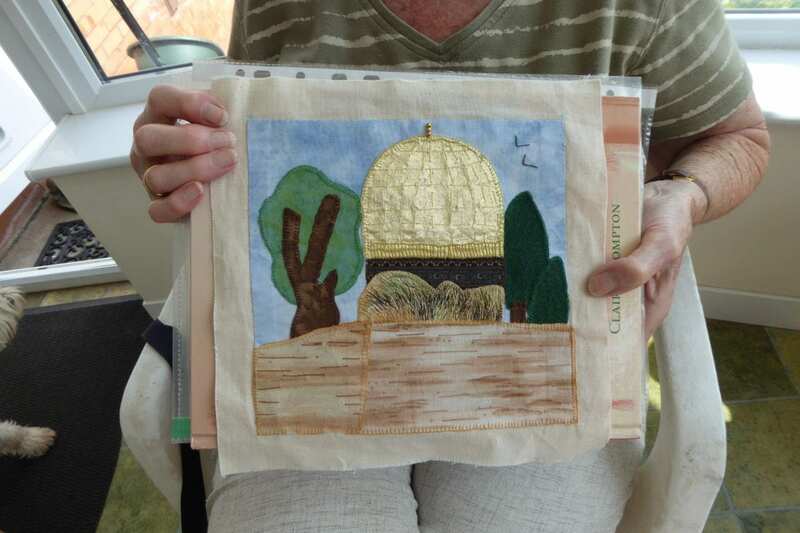 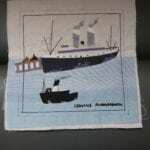 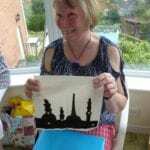 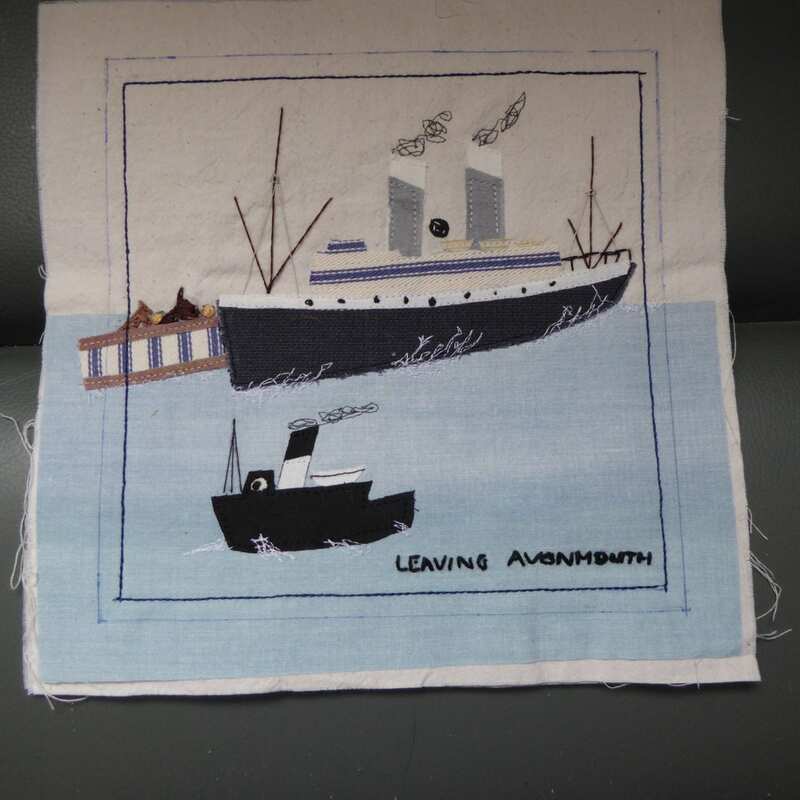 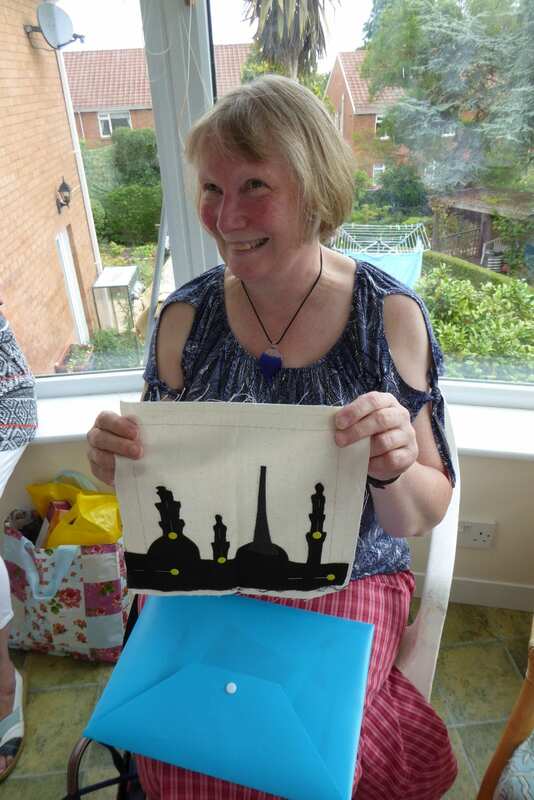 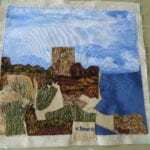 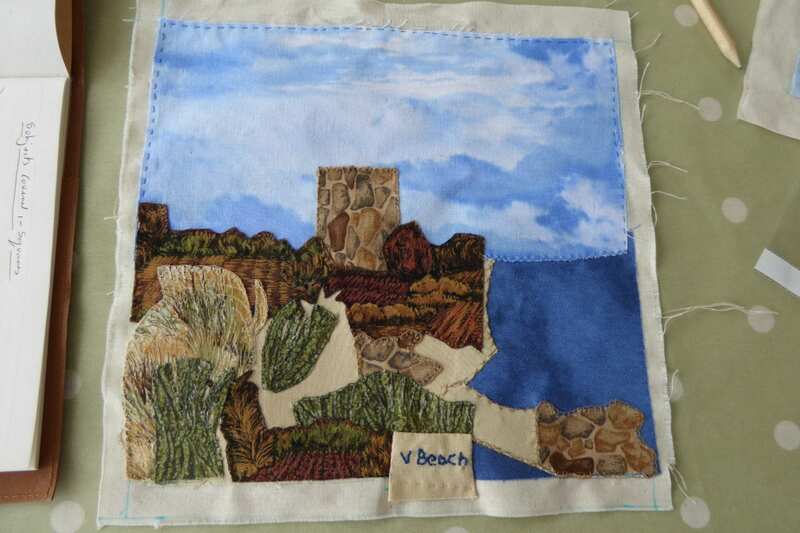 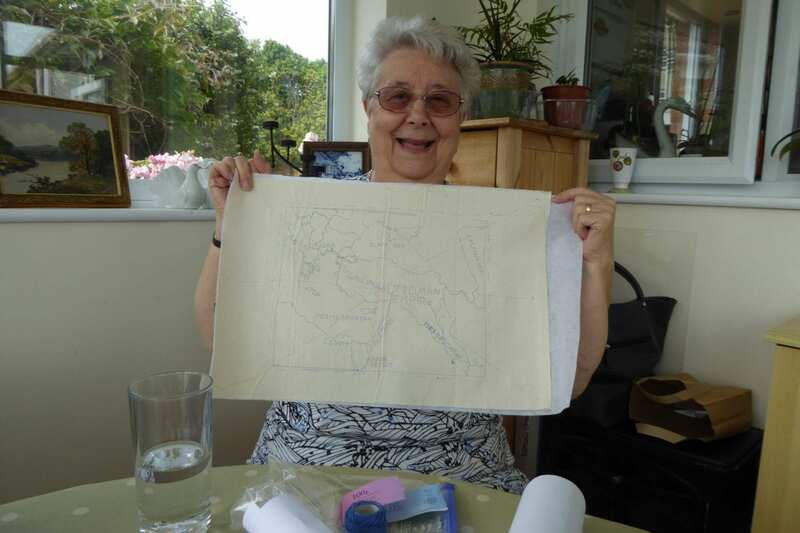 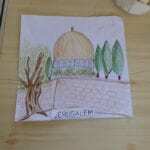 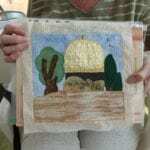 One quilter, Mary, took her square on holiday with her, and completed it on a cruise ship! 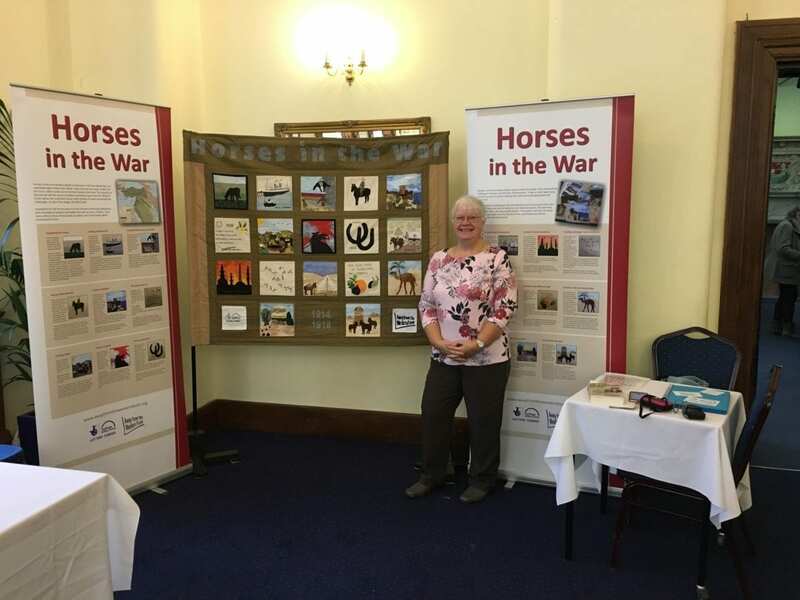 At our next meeting, at the start of September, the group will be joined by local historian Rita Tremain, who will speak about “Remount Stations”, where horses and mules were brought before being sent to war, re-training them for new types of work, and ensuring their health and condition. 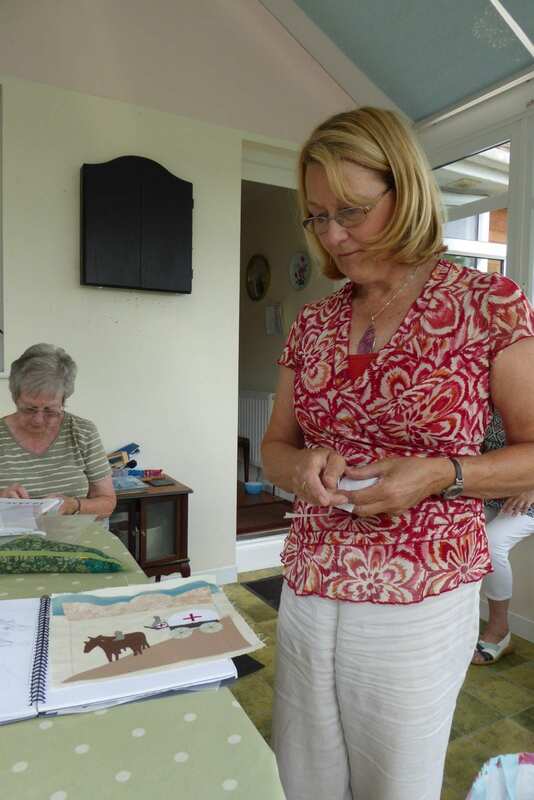 Remount stations 11 and 12 were situated just outside Minehead, so very local for the Quilters’ group. Designs for the banner panels are beginning to come thick and fast now, and the story is taking shape. 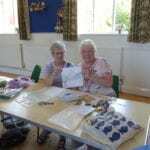 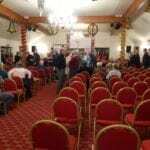 These photos were taken at the Minehead Quilters’ meeting on 16 July. 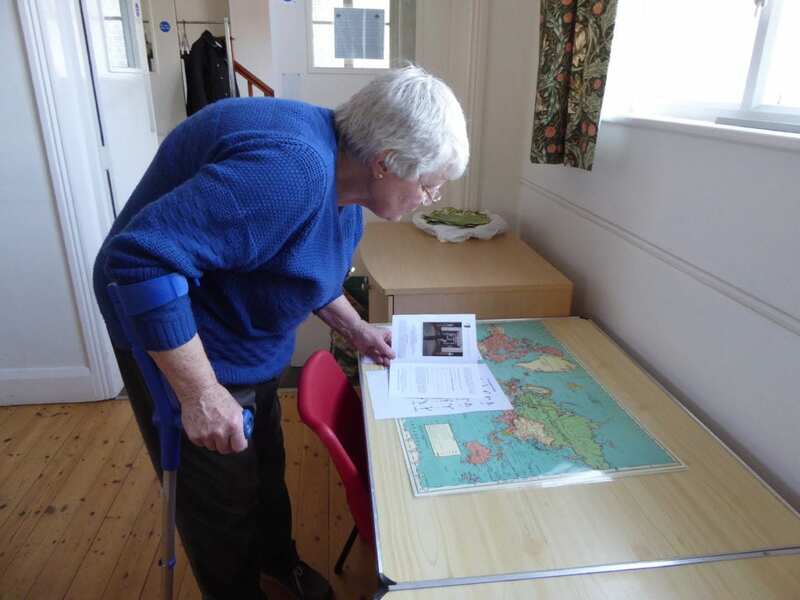 We enjoyed meeting Jane for an update on the project’s progress. 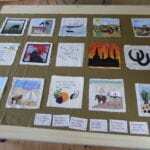 It was lovely to be able to handle two of the completed panels which look even better than they do in the photos. 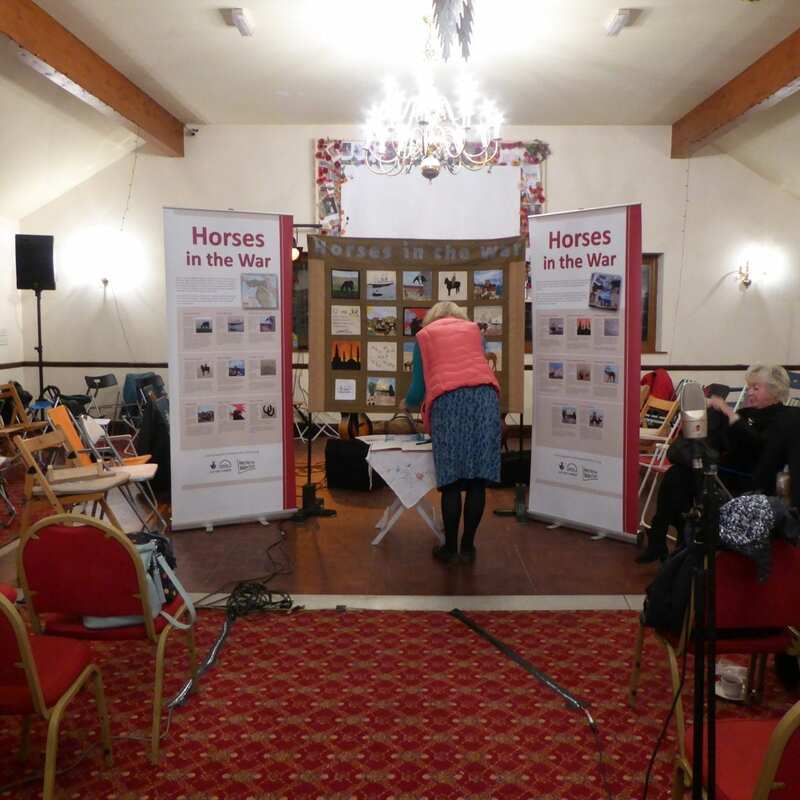 We discussed the various equine topics which will form the basis of the interpretative banner and shared ideas for the possible inclusion of others. 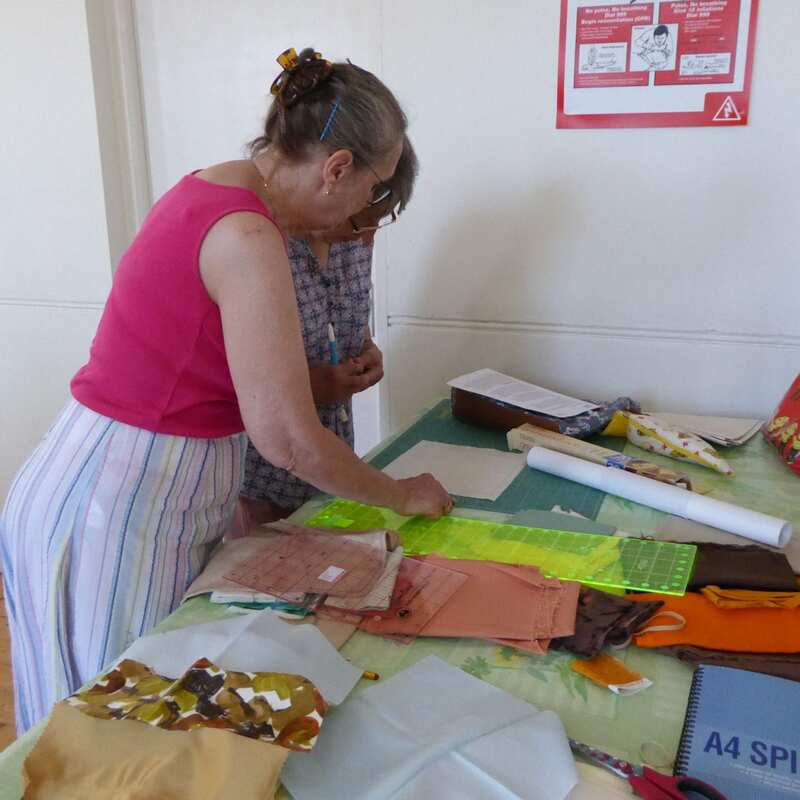 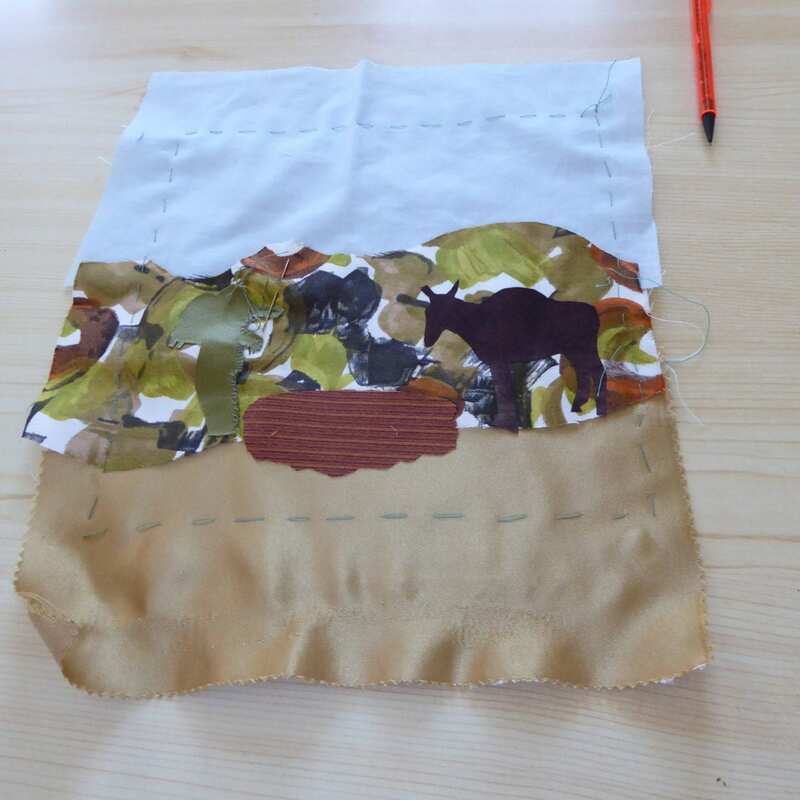 Jane explained how the individual panels will be sewn together and separated by sashing. 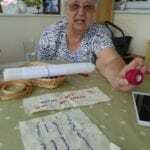 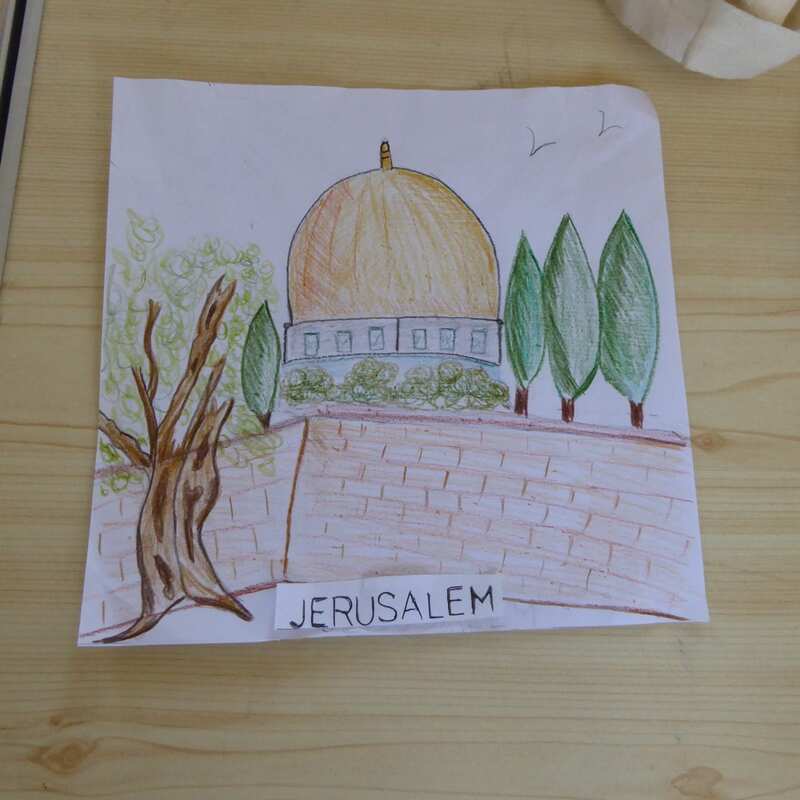 The group is still considering whether the banner could be double-sided and will update us as the work progresses. 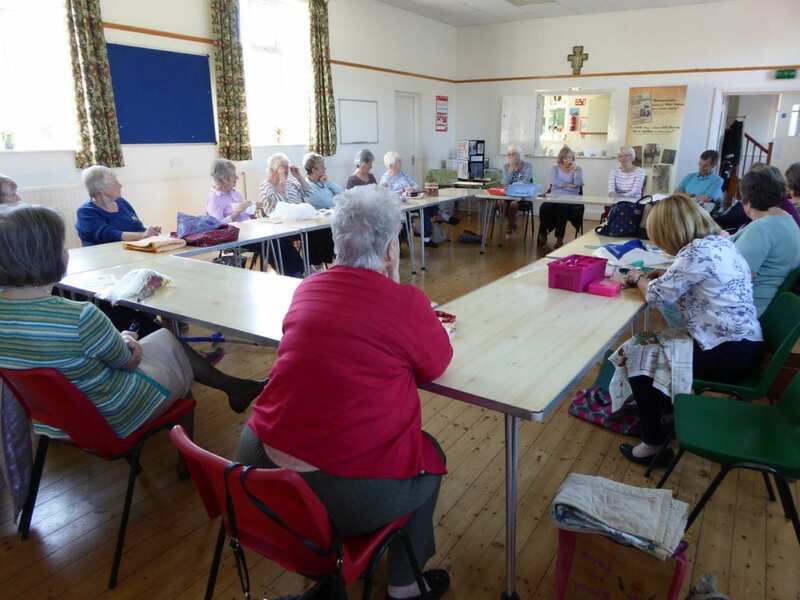 The project got off to a good start when members of the Minehead Quilting Group met Susan Burnett who introduced the theme of the project, with particular reference to the story of her grandfather Norman Woodcock.